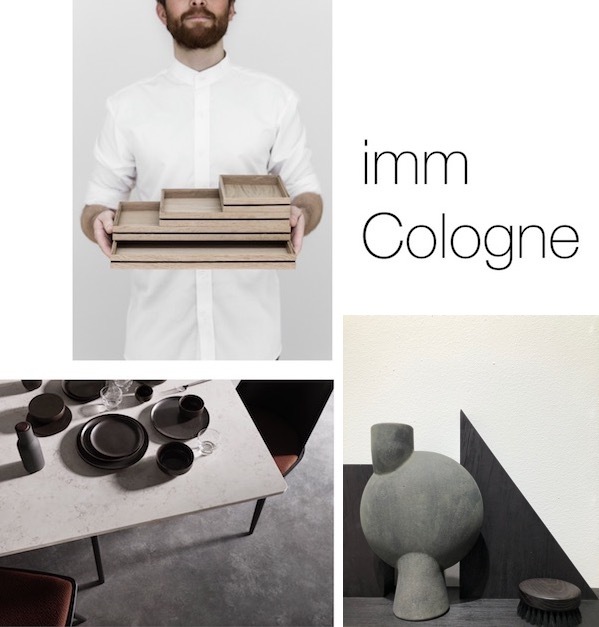 After bringing my personal style to life during the Bloggers’ Trend Show last year, I have been asked to come back to imm Cologne and share my personal design highlights in a Trade fair tour for the 2018 fair in Cologne. As said every theme needs a name and I called mine 'The new Scandinavian' giving visitors the opportunity to see some of my favourite brands. With a preference for minimalism and functional timeless design, I am mostly drawn to Scandinavian style which I love to combine with my own soft industrial touch. Scandinavian interiors are characterized by clean lines and minimum accessories. Comfort and function are important, and natural materials such as wood, metal, stone and beautiful fabrics are used frequently. The Scandinavian design industry has a long history, and a lot of companies are still family-run. They cherish their traditions and craftsmanship – something I really love about many of the brands. Nowadays, many of them collaborate with young designers to be able to offer the contemporary and much sought-after ‘New Scandinavian style’, bringing in new colours or using dark wood next to the familiar pale and muted colours. Many young brands follow in the footsteps of the established ones, embracing the Scandinavian basics of design while adding their own contemporary touch. imm Scandinavian favourites A recap of the brands I choose, and my personal favourite items.... of course after seeing the new collections some new favourites popped up! I will highlight some more of my favourites and their new collections in the coming weeks and add all other that caught my eye in my Pinterest albums, fairs are not the best places to shoot beautiful pictures but still hope you like to have a sneak peek. 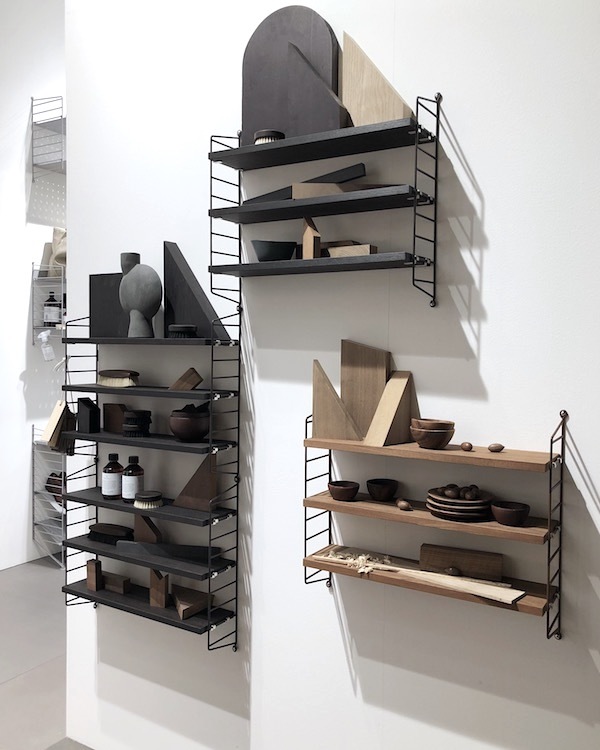 String was founded after winning a bookshelf competition by one of Sweden’s largest publishing houses in 1949 and has specialized in shelves ever since. In 2013, they expanded their offer through a collaboration with Björn Dahlström and Anna von Schewen that resulted in a folding table, followed a year later by ‘String works’, a flexible system for office and home including many accessories. 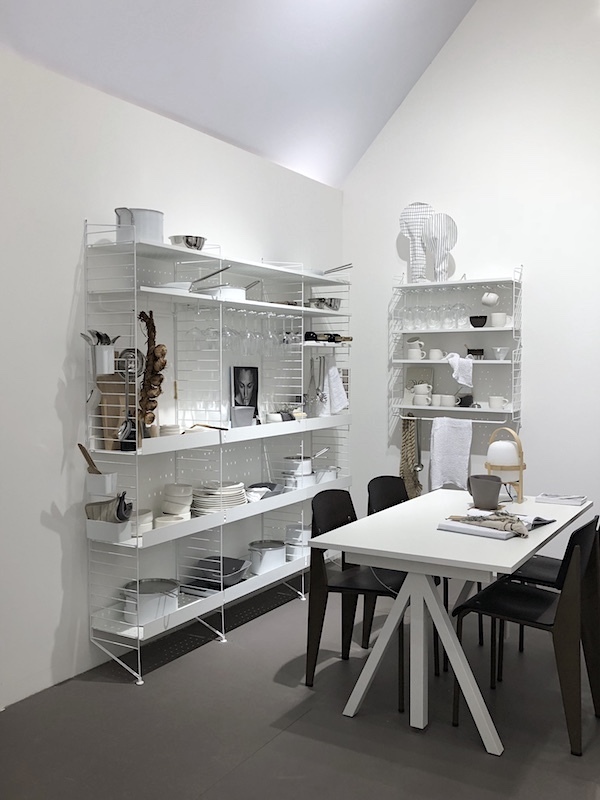 The String booth is always one the highlights of my visit at imm, not only because I love the shelving system, but also because of the amazing styling. Like in previous years, Lotta Agaton Interiors was responsabel for the styling, using the tiny homes as an inspiration the team build a small home that was inspirational and provided many ideas on how to use String in your own home. Last year in my own trend stand for imm I already talked about the new way of living I build my stand around. People want to sit, work and entertain in the same area's and String shelving offers everything to do so. 'New' are the metal shelves and also the hangers for your wine glasses are new, making the String combination as seen in the kitchen corner in the picture above a multifunctional wall system. There were many corners that caught my eye but I fell in love with the black oiled smoked oak pocket! Menu is probably the brand whose collection best represents my love for useful and timeless pieces that show a certain elegance. From furniture and accessories to textiles and homeware, I always find that something extra in their design that makes me want to buy it for my own home. 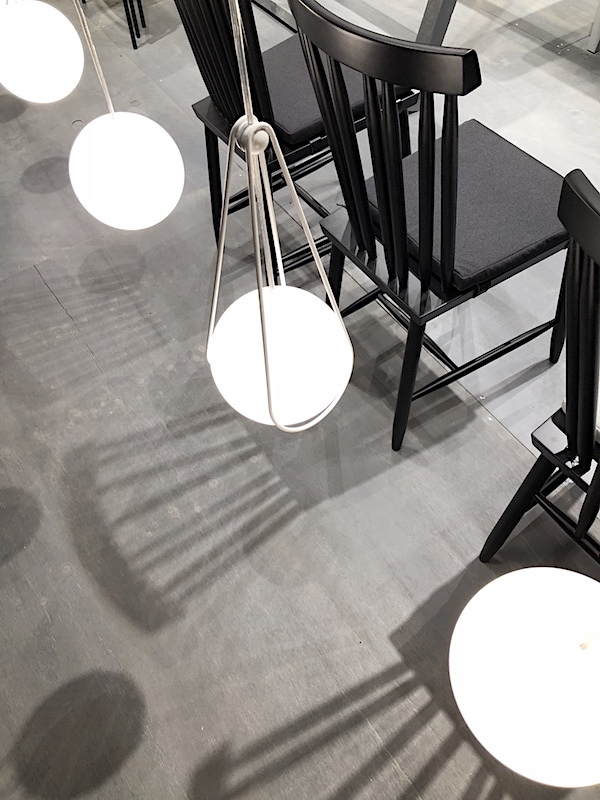 Menu collaborates with different designers such as Søren Rose, Taiwanese design duo Afteroom or Jonas Bjerre-Poulsen who has put his stamp on many of the furniture and smaller items. 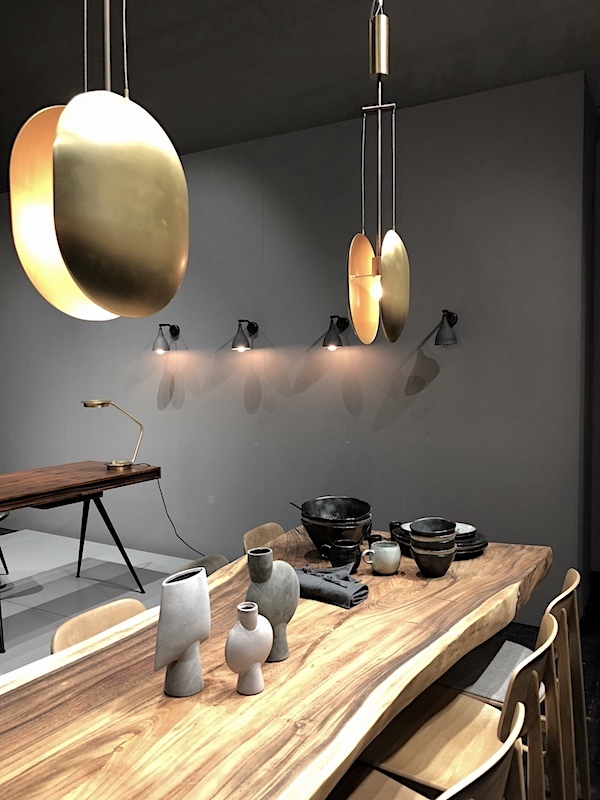 With all good design brands you always fall in love with their latest work and not only did the stand of Menu stood out by atmosphere, which I blame the new lamp collection for. 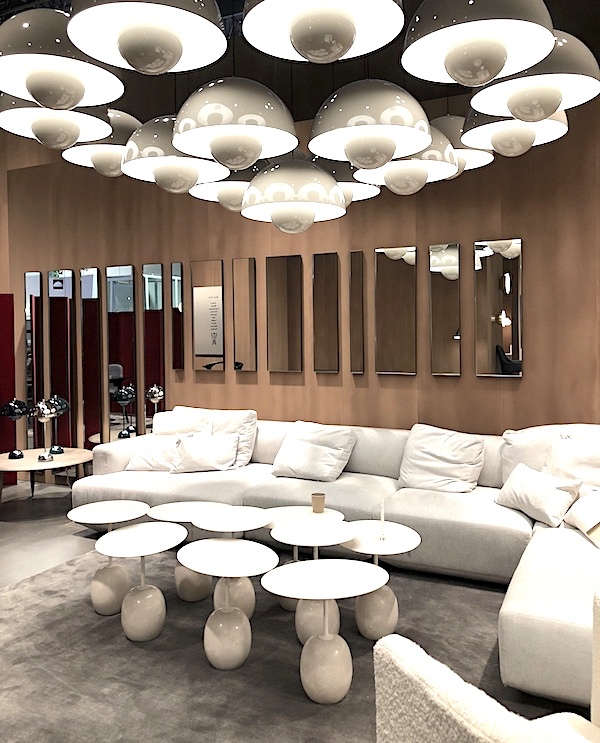 I simply loved their new pieces of which I already spotted some when visiting the Menu Space in Copenhagen, with the huge Eave couch and the Zet shelfs on top of my list. 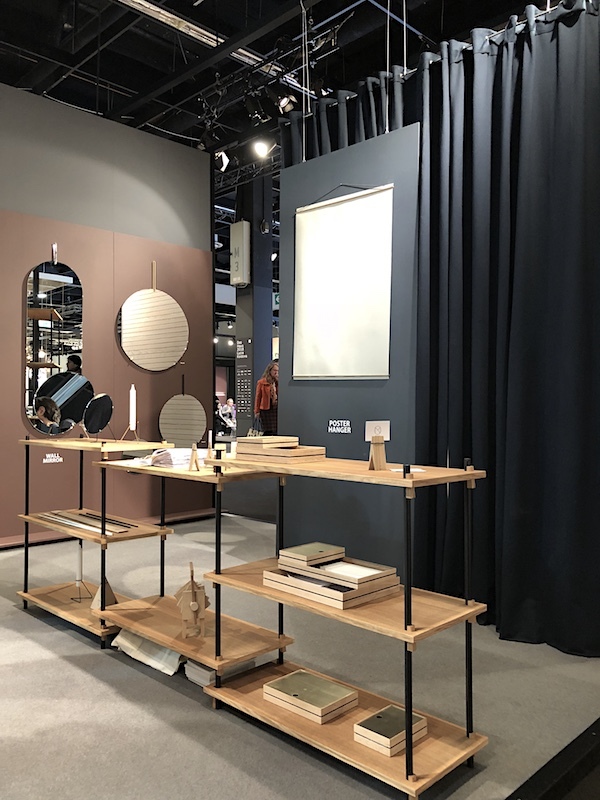 Until last year’s imm cologne, I was unfamiliar with Design House Stockholm, and first came across them in the list of exhibitioners to choose from for my stand. Design House invites designers to bring in their personal ideas, some of which are then selected for development and production. Working with both established and unknown designers, their ambition is reflect the very best Scandinavian design has to offer. It was the use of green in combination with light ash wood that caught my eye at their bright stand last year and this year it was the opposite. A huge stand again with a dark wall and a focus on among other their new light design and carpet. I was so happy to have chosen Design House Stockholm as I really loved the open stand and the huge amounts of black. It’s often the simple things I love most for my home. Moebe first caught my eye with their poster hanger made out of a metal rod and rubber band. This minimalist approach can also be found in their frames, which consist of four lists and a rubber band holding two pieces of acrylic glass. In collaboration with ‘Norm Architects’, one of my favourite design teams, and Copenhagen-based ‘Paper Collective’, Moebe created ‘Floating Leaves’, a series of beautiful images and frames inspired by botanic samples and illustrations. In addition to frames, Moebe offers different items for organizing and small furniture pieces such as mirrors. 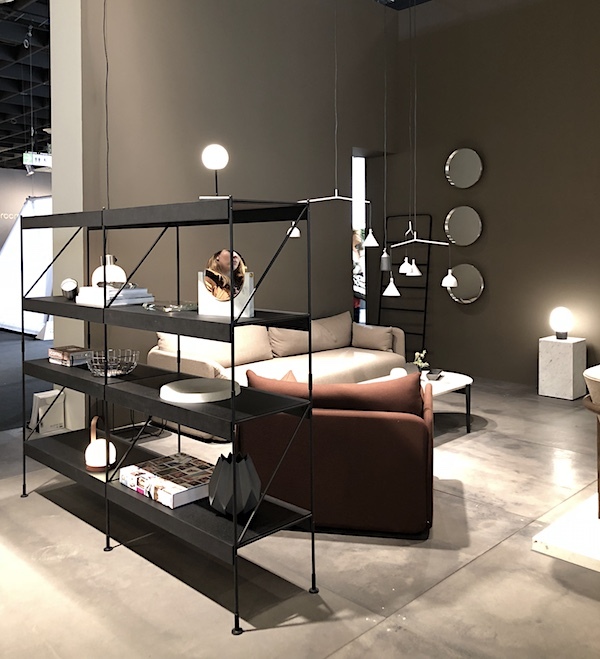 The company will now be launching its first larger furniture in form of a shelving system that Archiproducts already added to their design selection of 2018, a new coat rack and a full body wall mirror. Norr11 was one of my collaborating partners for my last year’s stand. I got introduced to them when visiting Iceland and have been following them ever since. With showrooms in Reykjavik, London and Berlin, NORR11 offers furniture pieces and home accessories. 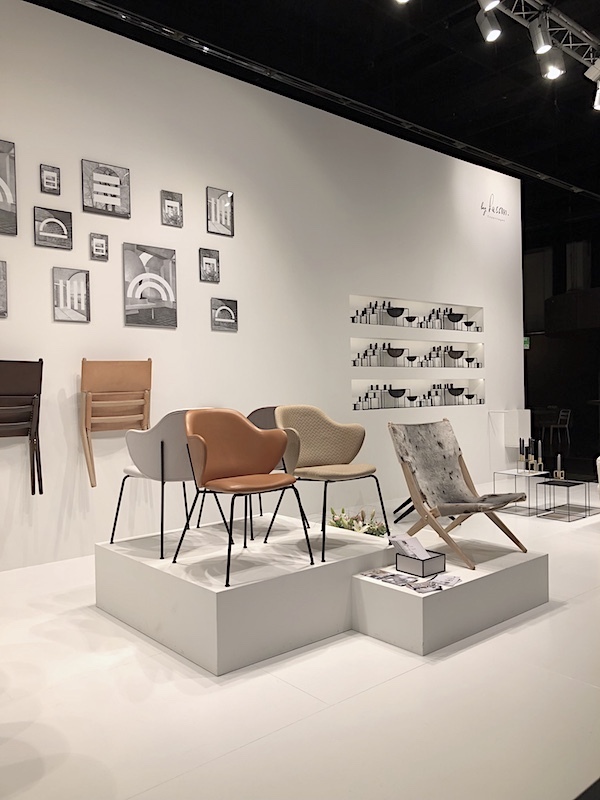 All of them are designed and developed in collaboration with young, ambitious designers who embrace innovative Scandinavian design and modern furniture architecture. The Lassen brothers were among the first architects to work with functionalism in Denmark. The style became a defining characteristic, especially for Mogens Lassen, who was inspired by the German design school Bauhaus. Its geometric shapes are often reproduced in his iconic designs of which the Kubus candleholder is probably the best-known. The company as we know it today was founded in 2008 – before that, the Kubus candleholder was reserved for good friends and family. In my own home I only have black galvanised candleholders, including the Kubus, which next to the frame collection is my favourite piece by Lassen. At imm they presented the new chairs they added to their furniture line. When I first visited Denmark, &Tradition was one of the first brands I got to know during a styling workshop given at Norm Architects, designers of the iconic Milk lamp. I have been following them ever since, and I think they have a beautiful and stylish collection designed by an international team. Choosing a favourite is almost impossible, the rice paper lamps are among my front-runners, as are different couches and smaller accessories. At imm & Tradition showed among others their new couch 'Develius' designed by Dutch designer Edward van Vliet Develius is comprised of 16 different modular sofa components varying in depth, width and shape.